The first fortifications at Caernarfon were built by the Romans. Their fort, which they named Segontium, is on the outskirts of the modern town. The fort sat near the bank of the River Seiont; it is likely that the fort was positioned here due to the sheltered nature and as traffic up the Seiont would have been able to supply Segontium. 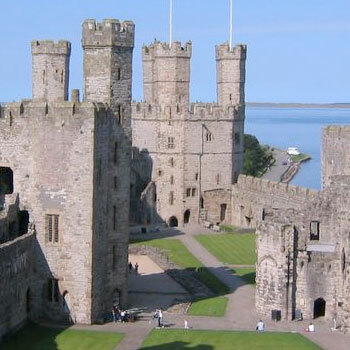 Caernarfon derives its name from the Roman fortifications. In Welsh, the place was called "y gaer yn Arfon", meaning "the stronghold in the land over against Môn"; Môn is the Welsh name of was the island of Anglesey. Little is known about the fate of Segontium and its associated civilian settlement after the Romans departed from Britain in the early 5th century.